There’s a brand new thing happening for women around Fellowship North, and we’ve asked Jen Holsted to share about it with us. Like Men of the Ozarks (MOO), it’s a small group retreat that happens several times a year. A few years ago a handful of women began to meet and pray for the women of Fellowship North. They had seen how Men of the Ozarks had changed the lives of so many men, and they wondered if a similar experience might be possible for women. They longed for a spiritual awakening among themselves and among the women of our church. 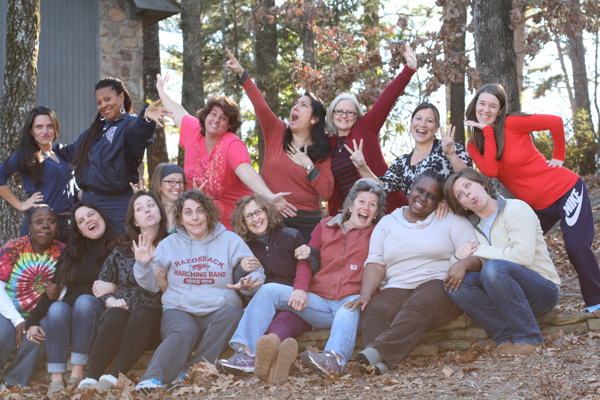 Those prayers eventually led to the creation of Woman of the Ozarks, a weekend retreat designed for a small number of women with the hope of both spiritual and relational awakening for those who attend. God used my experience with WOO to show me just how much of myself I hold back from Him and from others. God can use all of me – even the things that I would prefer to hide – for His glory. And it is only when I fully trust His love and grace that I can truly be open to others and love them the way He wants me to. Our inspiration for this retreat came from the men, but this is not a “MOO for girls.” This is a retreat designed by women, for women. And it is our desire that every woman at Fellowship attend. But, because of the nature of the retreat, only 8 can go at a time. Even if we have 4 retreats a year that is only 32 women. We know that it can be frustrating to have to wait, but we have confidence that the Holy Spirit knows the exact right time for each woman to go. We also know that you might have some questions. Our leadership team would be more than happy to answer your questions or explain more about this new venture. The leadership team is Diane Heffington, Ines McBryde, Nancy Powell, Emily Whitley, Amy Harrison, Jennifer Holsted, Dena Nash, and Stephanie Clouser. If you are interested in attending a WOO retreat you can contact Diane Heffington at 771-1117 or by email. There are so many ways to connect with other women at Fellowship North! Join a small group, come to our Monday night Bible study, or be a part of our twice-yearly Silent Prayer retreats. Email Inés McBryde to find out more about women’s ministry at Fellowship North.